Beach Life Fitness Boutique in Redondo Beach, CA. Coremom Prenatal and Postnatal Fitness Specialists. I recently sat down with Kim Lyons the owner and creator of the Bionic Body program. Kim is also a former IFBB Fitness competitor and trainer on NBC’s hit show “The Biggest Loser”. She is a published author, fitness motivator, well-known celebrity trainer and mother to a 7-year old son. I had the fortune of meeting Kim in April of 2015 and told her about my experience working with pregnant and new mothers. I explained what would become the ‘Coremom‘ fitness program that I had created specifically for moms. Kim loved the concept and recognized a lack of exercise programming for pregnant clients and new mothers especially in the Beach Cities area of Los Angeles. We decided to introduce “Bionic Mommy” as a program geared towards new mothers and pregnant women to the Bionic Body family in June 2015. I wanted to find out about Kim’s pregnancy workout routine and what worked for her and also to see how the Coremom program has affected the Bionic Body brand since including it into her gym. Q: How did your exercise routine change once you became pregnant? Kim: I’ve been exercising and studying as a trainer for over 18 years so I was very comfortable working out when I was pregnant and postnatal. I had to modify so many exercises when I was pregnant and give myself time to return to many exercises after childbirth. I did most of my core work standing up and had to listen to my body closely so I didn’t over do it. I felt so blessed to have the knowledge and understanding on how to modify the exercises that needed a simple change and knowing what exercises needed to be avoided. Q: When you were pregnant what kind of workouts did you do? Kim: I did a lot of resistance training when I was pregnant and continued all my normal activity, although it was much slower. I was extremely tired the first trimester, but felt great the last two. Q: Did you find there was a lack of exercise programs that were simultaneously challenging and safe for you? Kim: I would have loved a group class that was something other than prenatal yoga or just walking with a stroller group postnatal, but really didn’t find anything at all. There are so many trainers that are “pre and postnatal” certified, but very few truly specialize in that area. It’s so important to have a program built for the special circumstances that can arise when you are pregnant or recovering from childbirth. Q: As a new mother, did you find challenges with finding time to exercise, even though it is a big part of your life? Kim: I really expected everything for me to be “easy” post child-birth. It wasn’t! I couldn’t believe how week my pelvic core was and it really took time, knowledge and research to repair it. I had pretty bad diastasis and I had to learn how to work to improve that and not make it worse. Taking the time to do that was a bit frustrating and it was hard to be patient with myself! I was blessed with a baby that slept really well from day one so I was able to maintain my nighttime sleep schedule. I had really good energy and when he napped I worked out or had him in the stroller and I was on the go, up and down hills. The key is to get them on your routine and not for the to rule your routine! Q: How did you decide to incorporate Coremom “Bionic Mommy” into the Bionic Body family? Kim: When I met Danielle, it was a no brainer! Her passion and knowledge for training pre and postnatal women was one in a million. Pre and postnatal fitness is critical for your and your babies health, yet there are so few good programs for mommies and mommies to be. I love everything about the Bionic Mommy program, it’s one in a million! Q: Since the inclusion of Bionic Mommy, have you seen an increase in membership at your gym? Kim: It’s been amazing to see all the new moms in the gym. It’s also amazing to watch our clients that didn’t have kids transition into the Bionic Mommy program as they go through their pregnancy. Most people have to quit the gym and come back when their babies and 6 months old or get a sitter. At Bionic Body, we are there for the entire transition. 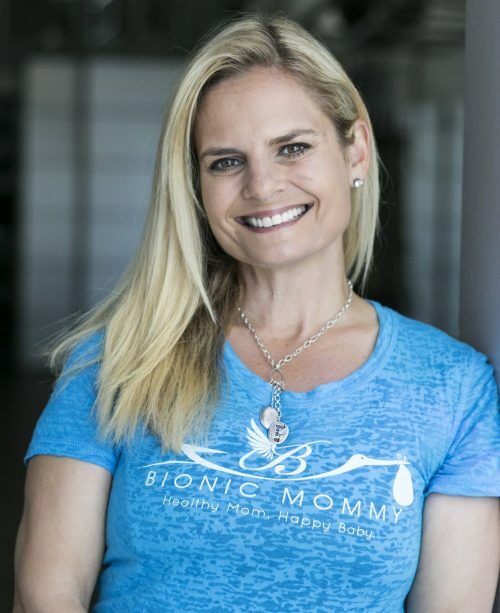 Q: How has Bionic Mommy helped the Bionic Body Brand? Kim: Pre and postnatal fitness is something you don’t see in every gym. When I built Bionic Body, my vision was to embrace all disciplines of fitness including everything from circuit training to yoga, barre and pilates. Adding Bionic Mommy really completes the full spectrum, we truly offer everything for all ages and levels of fitness. Q: What kind of benefits can pregnant women and mothers expect to see from joining the Bionic Mommy classes? Kim: When you come to the Bionic Mommy Classes, you know you and your baby are in good hands. It’s important to understand what is going on with your body and to have peace of mind that you are doing what’s best for you and your baby. At Bionic Body, you don’t just go through the movements, you learn while you have fun and connect with other moms. Q: What are some things you would like to tell potential members about the Bionic Mommy program that will encourage them to try it? Kim: Being pregnant is an emotional rollercoaster! It’s can be scary and exciting at the same time. At Bionic Body, you’ll be surrounded by other moms just like you. Moms that won’t give you stink eye if your little one is fussy or if you need to step out to feed your baby. It’s pretty much the only place that everyone in the room can has “been there” on your bad days and can lend a helping hand! Kim: As a new mom, you spend an incredible amount of time taking care of your little one, and truthfully, you are the most important one to take care of. It all comes back to putting your “oxygen mask on first”-not because you are selfish, but because it’s critical for you to be in your best health for your family. In the spirit of Thanksgiving I would like to focus on “gratitude” this week. Gratitude is something I do not take lightly. We all have our struggles but it’s within those struggles that our “achievements” begin to shine brightly. As a mom I quietly express gratitude every day to myself. I know I am “grateful” every day for the three kids I have (at least most days). I am also eternally grateful that these three people seem to be happy and well adjusted, (until I find out later through therapy how I screwed them up). But, in all honesty, I am grateful they are healthy, kind, smart people. This is something I try not to take for granted. I would like to share my first pregnancy and birth story. Even though it was not the picturesque pregnancy and delivery one thinks about, the ending was happy and the experience made me a mother to which I am forever grateful. I also want women to know that pregnancy and delivery has it’s challenges and it’s important to focus on the positive parts. It’s important for women to understand that they are not alone in their experiences and that even though its hard not to compare your experiences to others, it’s important to stay focused on the gratitude. My first pregnancy came when I was 29 years old. Having my own babies was not on my mind but something I thought would happen in the distant future. I unexpectedly became pregnant by my then live-in boyfriend (now husband of 16 years). A trip to the oral surgeon landed me on antibiotics that apparently negated the effects of my birth control. Yes! That happens. I did not find out I was pregnant until I was around 11 weeks along and almost out of the first trimester. You can imagine my shock as I wasn’t ‘planning’ but trying to ‘prevent’ a pregnancy. My shock and sadness quickly turned to acceptance when we both realized that we were indeed pregnant and ready to introduce a bundle of joy into the world. Even though I was not planning a pregnancy, I guess in a way I was grateful that it was something I did not have to worry or stress about anymore. The rest of my pregnancy was fairly uneventful. I had no morning sickness and I felt relatively good compared to what I had heard from other women. I did however eat like a 200-pound football player and I gained so much weight that by the end I resembled “Jabba the Hutt” by the third trimester. I exercised hard EVERY single day of my pregnancy, but despite this the weight piled onto my body. This was years before my plant based eating habits, so It could have been my daily trips to In-N-Out Burger! DUH! The birth unfortunately was not the dramatic soap opera scene I had concocted in my head. Instead, it was very anti-climatic. It was at my 41-week check up that my doctor announced I was borderline “Toxemic” and sent me straight to the hospital for induction. After 24 hours into the induction, labor was not progressing. I was informed that the baby was in distress and a cesarean section was necessary. Though disappointed I could not deliver the baby the “old fashioned way” I understood it was in the best interest of the baby and myself. So I was grateful that my baby eventually was brought into the world healthy and safe. After childbirth my body looked like something out of a sci-fi horror film (which no one tells you about) but I persevered as women do and with time and dedication I began to take the shape of my former self once again. I learned that even though things change with our bodies, it’s important to keep fighting for our health and strength. I have learned to “embrace” the imperfections that do not live up to ones expectations. Gratitude is a mindset and a way to reflect on the best things in your life. Continue to be grateful and love not just the babies you created, your family and friends but love YOURSELF. Even though I joke that I looked like “Jabba the Hutt”, I was grateful that I got to have the experience even though my body was unrecognizable. Passing on gratitude is something you role model. You show your child(ren) it’s important to be grateful for everything in life. Being strong and healthy is just two of the many things to be grateful for. Exercise and proper eating habits prove “gratitude” as you are willing to be your best “self” for you and for them. Danielle’s Website is live! How exciting is that? Welcome to my pretty, fresh, new website for my Prenatal and Postnatal fitness blog! I am so happy you are visiting my site. Fitness for moms has been a labor of love (no pun intended) and a journey as a mother and pre-and postnatal fitness specialist. I am thrilled to see my business evolve and expand over the years. Long before I became a mother, I accidentally “fell” into this specialized area of fitness due to my natural curiosity about the lack of information available regarding pregnancy and exercise. It was during a graduate level special populations exercise physiology course in 1995 that I discovered there was little research in the field of fitness supporting women’s health, specifically during pregnancy and after. Sadly even years later, there is still a lack of “real” research and information in this area. It became my obsession and my passion to deliver the best exercise practices before, during and after pregnancy that help women achieve the benefits of optimal health. My ultimate goal is to help mothers feel good inside and out. While pregnant and especially after giving birth to three children, I recognized even more the importance of regular, appropriate exercise and healthy eating practices for facilitating my recoveries. I realized that without a healthy, strong mamma, the family balance was not sustainable. I am grateful for my journey to help pregnant women and mothers regain their strength and vitality and my goal is to help all women find balance and sustainability with their fitness choices. As my business has grown I am able to offer more services through technology to expand my audience and bring my knowledge and passion to more women outside of my immediate community. Last year I took my life’s work and research and licensed my exercise program called “Coremom”in the hopes that other corporate entities, gyms and fitness studios will also recognize the lack of good exercise programs for this specific population and help serve these women. Again, my hope is to bring this type of programing to the broader community. Please take your time, browse the site and forward this information on to family and friends who might benefit from my services. If you are not local to Los Angeles or specifically the town where my studio is located (Hermosa Beach), please know that I am now offering Skype private training and soon skype exercise classes to help women from all over reach their fitness goals through my knowledge and exercise programming. More videos, blogs and eventually ebooks will be coming soon so stay tuned and subscribe for weekly updates.